As humanitarian agencies and their field staff worked to relieve the suffering of tsunami survivors in India and Southeast Asia, the people of the archdiocese contributed almost $1.8 million to the effort. Most of the amount came from parishes following a collection taken up at Masses Jan. 2; some came from individual donations in the days that followed. The funds have been sent to the papal representatives in the nations affected by the disaster. In a letter to the pastors of the archdiocese, Cardinal Egan thanked them and their parishioners. 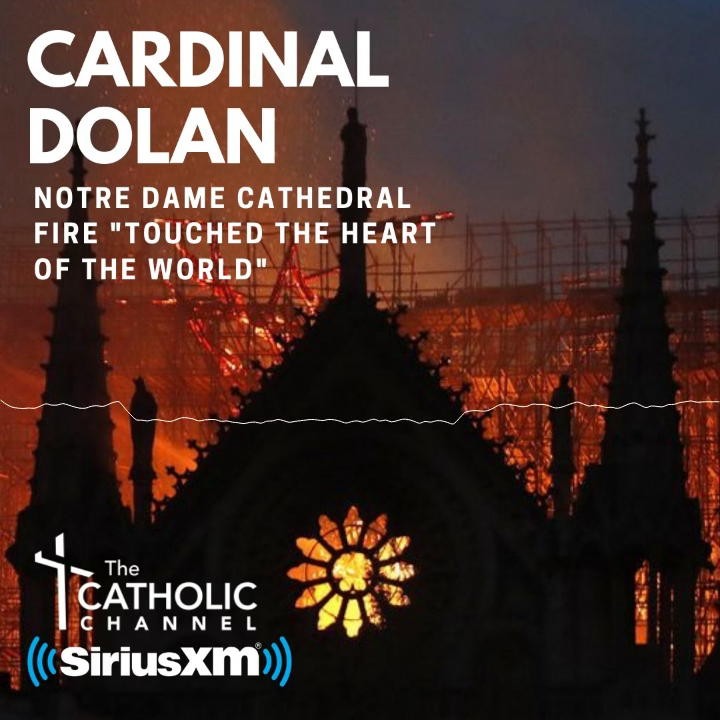 "This manifestation of the generosity and compassion of our people," he wrote, "is a great testament to their love of the Lord and all whom he came to save at every moment in history and across the world." Students at schools in the archdiocese also responded swiftly and generously. Many parishes are served by priests from the stricken countries, and parishioners and students have given funds they raised to those priests for distribution through Church authorities in their homelands. In Manhattan, Mother Cabrini High School combined its tsunami activities with its commemoration of Martin Luther King Jr. Day. Everyone at the school was encouraged to donate at least one day's lunch money. The effort raised $1,200, which was sent to Save the Children Federation, which works in the area devastated by the tsunami. Students also participated in a prayer service for all who were affected. Holy Cross School has collected nonperishable baby food, diapers and other infant items in cooperation with a Buddhist temple in Queens. The goods were shipped to Sri Lanka. Students also raised funds to buy ready-to-use baby formula. Three schools are collecting funds for the Marist Brothers relief efforts in Sri Lanka, India and Thailand. They are St. Agnes High School in Manhattan, which is run by the Marists; Our Lady of Lourdes High School in Poughkeepsie, where a Marist is principal and the congregation is involved in the school; and Sacred Heart in the Bronx; Marist Brothers operated Sacred Heart Middle School, which was combined with the elementary school. Sacred Heart also collected funds for an orphanage in Sri Lanka in an effort coordinated by a seventh-grade teacher. In the Bronx, Our Lady of the Assumption School raised $275 in a raffle. The money was sent to the sister of one of the parish priests who is the principal of a Catholic school in India where 100 students lost parents, mostly fishermen. St. Luke's School raised funds quickly and gave them to a visiting religious sister who was returning to Sri Lanka Jan. 7. The funds were raised from donations and from projects such as bake sales. Holy Spirit collected $1,738 through various efforts and gave the money to the parish administrator, Father Joseph Vijayan, who is sending it to his diocese in the Tamil Nadu province of India, where his family lives. (His immediate family survived but other relatives perished.) Melanie Rivera, a sixth-grader, sought donations from family members and friends and raised $330 on her own. All Hallows High School has been collecting funds. A senior, Freddy Sinchi, donated money from his earnings at a part-time job. By mid-January, Preston High School students had raised more than $1,000. At the request of a Sri Lankan teacher at the school, students also began collecting clothing and school supplies which have been shipped in care of Archbishop Oswald Gomis of Colombo, Sri Lanka. Students at Msgr. Scanlan High School donated $1,800; the funds will be sent to the bishop of the diocese of a priest serving at St. Helena's parish, of which Scanlan is part. Students at St. Mary Star of the Sea, City Island, collected $842.50 and gave $500 to Father Eugene Sudath of Sri Lanka who had served at the parish until recently. The remainder was given to a Sri Lankan sister who had been living in the Bronx but returned to Sri Lanka recently to open an orphanage. On Staten Island, Blessed Sacrament School collected $4,200 as well as supplies to be sent to Archbishop Gomis of Colombo. Friends and neighbors of the parish custodian supervisor, Patrick J. Gerardu, were affected by the tsunami. He reported that parishioners had responded very generously to his request for help. Students at St. Joseph-St. Thomas raised more than $3,600; the parish increased the amount to $4,490. The funds will be given to Father Joseph Tiserra of Sri Lanka, who formerly served at nearby St. Clare's parish. Our Lady of Mount Carmel-St. Benedicta joined the local businesses that declared Jan. 13 Tsunami Relief Day. Students collected school supplies in conjunction with a Buddhist temple on Staten Island. At Holy Rosary, students fasted from snacks for four days and donated the money they saved. They also raised funds from the sale of a school newspaper. The proceeds were donated to Father Albin Roby, parochial vicar at St. Charles parish, for his village in the Tamil Nadu province. St. Paul's collected medical supplies which were shipped from Blessed Sacrament parish by members of the Sri Lankan community. The children also brought in bags of individually wrapped hard candies and gave them to Father Lourdes, S.M.A., who stayed at the rectory in December. He will distribute the candies to children in his hometown in India and tell them that the candies come from U.S. children who are praying for them. Holy Rosary School in Port Chester is collecting "coins for kids" in water jugs on each floor of the two-story school and will continue the collection through Lent. The funds will be donated to the Salesian Missions; the order staffs the parish. SS. Peter and Paul in Mount Vernon raised more than $1,000 in a collection at its First Friday Mass. The school gave $200 to Father Claude Hettiarachchi, who is serving at the parish; he sent it to his native Archdiocese of Colombo for its Tidal Wave Fund. The remainder went to Catholic Relief Services. Archbishop Stepinac High School in White Plains is holding daily events and bake sales to raise money, which will be given to Brother Richard Therrien, O.F.M. Cap., a teacher at the school, whose order has missions in the area affected by the tsunami. Students at St. Theresa's in Briarcliff Manor collected money during Catholic Schools Week to be given to Father Praxid DeSilva, a parish priest who is from Sri Lanka. Students, faculty and staff at Iona Prep in New Rochelle held a dress down day and raised more than $5,000, which will be sent to Catholic Relief Services. The Ursuline School, also in New Rochelle, set a goal of $5,000 to be raised at events during exam week including a faculty bake sale. Christ the King in Yonkers gave the proceeds from its most recent home basketball game to an Indian priest who is serving at the parish, Father Abraham Chacko of Kerala. Immaculate Conception School in Tuckahoe raised $10,500 for the home diocese of Father Joseph Emmanuel Athmasaran of Sri Lanka, a parochial vicar at the parish who was incardinated into the archdiocese recently. The parish raised almost $15,000. Father Athmasaran lost seven cousins in the disaster, and he visited Sri Lanka last month. He told CNY that he gave the school's gift to the Jesuits in Batticaloa, his hometown, for schoolchildren, and the funds from the parish to Bishop Kingsley Swampillai of Batticaloa and Trincomalee for general use. The bishop said that he would use the money "mainly for the children," Father Athmasaran said. He remarked that the children need clothing, shoes and school supplies. He added that there are at least 400 children in Sri Lanka who lost both parents in the tsunami. They are to be adopted by extended family members, and the government will provide money for their support, he said. He spoke of people who have lost the means to earn a living: fishermen without boats and nets, carpenters without tools. He met a former high school teacher who asked for money for pots and pans. The people are "really frustrated," Father Athmasaran said, because they long for rebuilding to begin but the authorities are "still discussing" how to go about it. Meanwhile the people are being fed and housed in school buildings. Students in the confirmation class at St. Denis, Yonkers, raised more than $1,000 to assist the family of a classmate from India. The funds were brought to the family by the student's uncle. Two fourth-graders at St. Columbanus in Cortlandt Manor, Emily Bilotti and Rachel Danko, led a penny drive that brought in donations from students in preschool through eighth grade. The proceeds, still being counted, will be sent to Catholic Relief Services. Students at Immaculate Conception, Stony Point, had a dress down day to raise money and also collected school supplies. Father Joseph Soysa, who serves at the parish, is bringing the funds and supplies to his native Sri Lanka this month. The principal, Adele Pascucci, told CNY that the school plans to "adopt" a Sri Lankan school, and the students will pray for each other. A fourth-grader at Immaculate Conception, Ashley Columbia, 9, was so moved by the suffering caused by the tsunami that she established her own nonprofit organization, Ashley C.A.R.E., to raise funds. She has raised $8,000. Mrs. Pascucci remarked that Ashley's family is "very socially conscious," and she added that Ashley's effort "shows that when the school and the family share the same values, the children can do wonderful things." Among the local agencies that are assisting survivors are the Catholic Medical Mission Board (CMMB), which provides medicines and health care worldwide, and the Catholic Near East Welfare Association (CNEWA), a papal agency that supports the Catholic Church in the East. Both agencies are based in Manhattan. CMMB has created the Tsunami Survivor Relief Fund and has committed $3.1 million in health care aid to India, Indonesia and Sri Lanka. The agency has received $370,000 in donations and pledges. It has given $100,000 to faith-based groups in India with which it works in partnership. Almost $2 million in medicines and medical supplies will go to teams of medical volunteers from the United States working out of Batticaloa. CMMB also is working in Indonesia in partnership with the International Medical Corps, a relief organization based in Santa Monica, Calif.
Michael La Civita, spokesman for CNEWA, told CNY that none of the institutions supported by the agency - such as child care facilities and seminaries - were directly affected by the tsunami. But he added that CNEWA is supporting relief efforts and is channeling funds through local Church authorities.